Radiators are an efficient, cost-saving way of heating a house. 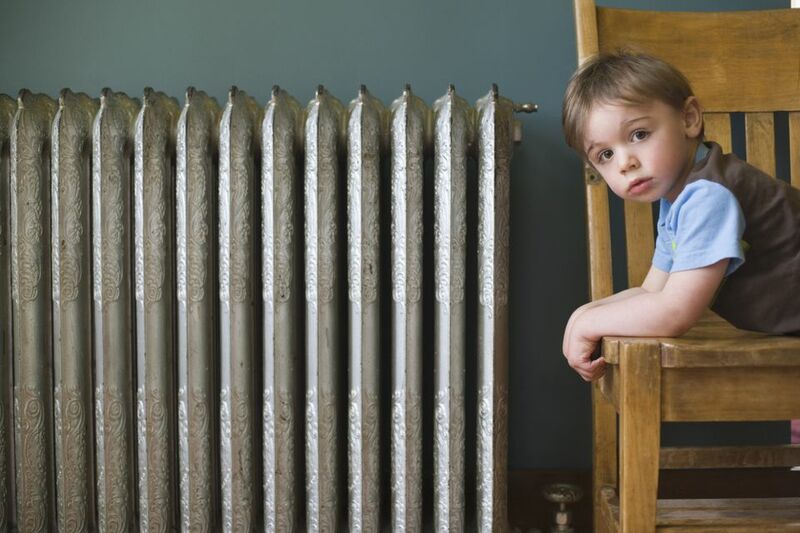 Even after the furnace has finished its cycle and brought a room up to its thermostatically controlled temperature, the radiator continues to emanate heat. Even their delivery pipes are a heat source, spreading the warmth out over a long, narrow area. The benefit of any radiator, hot water or steam, is its efficiency. It does not deliver dry, heated air to the rooms, as does a forced-air HVAC system. There are two basic types of water-based radiators: the hot water radiator and.the steam radiator. Description: Hot water radiators have water that is heated from a central boiler continually running through them. This water either runs in a loop (one-pipe system) or up and back down again (two-pipe system). Two Types: Hot-water radiators can look either like the conventional, "stand-up" radiators or like the low-profile baseboard heaters. No Humidity: Unlike steam radiators, hot water radiators do not have the added benefit of increasing the humidity in the rooms, often a necessity in dry winter months. One-Pipe: In the one-pipe system, hot water leaves the furnace and moves in a continuous loop, returning to the furnace as cooler water. This cooler water is re-heated and sent out on its journey again. Two-Pipe: The two-pipe system moves hot water to the radiators in one pipe and returns it to the boiler in another pipe. Description: If you have a pre-1950 house and it has original radiators, they are most likely steam-based radiators. As the name indicates, the heating source that runs through the supply pipes and into the radiators is steam. This is created in a furnace located in an area separate from the living spaces, usually a basement. One-Pipe System: In the one-pipe radiator system, a single pipe runs from the furnace to each radiator. Steam is driven through it, fills the radiators, and then condenses and runs back down that same pipe in the form of water. The water is recycled and used again in the next cycle. Two-Pipe System: In the two-pipe radiator system, one pipe delivers steam to the radiators and a second pipe separately returns condensed water to the furnace. Escaping Steam: Steam radiators can be messy. Many older homes with steam radiators have warped floors around the radiator area, an almost unavoidable byproduct of having a pressurized steam unit inside your house. Furnaces generating steam do so under pressure, and while it is rare, it is possible for these furnaces to explode. The Noise Factor: A house with steam radiators is never a quiet house. While you can take measures to dampen the sounds, you will always experience some degree of pipes clanking and steam hissing as it escapes from the valves. This is usually considered the price–or benefit–of living in an older home if you can accept it. One reason both hot water and steam radiators have slowly been phased out is the potential for leakage. No matter how much effort you put into maintaining a centrally-based radiator system, leakage will occur at some point. Hot water heaters are considered to be more efficient than steam radiators. This is because hot water heaters move the water through the system using a pump, which allows the water to move at a predictable rate. However, both are quite efficient in that they can be zoned; radiators can be turned on or off in individual rooms. It's also important to keep in mind that while delivery pipes can act as heaters within rooms, they also waste energy when they run through other areas of the house, such as between the floor and ceiling.